This article forms part of IPS coverage of International Workers Day, celebrated May 1. LIMA, Apr 27 2017 (IPS) - A large proportion of the 4.3 million migrant workers in Latin America and the Caribbean survive by working in the informal economy or in irregular conditions. An invisible wall that is necessary to bring down, together with discrimination and xenophobia. 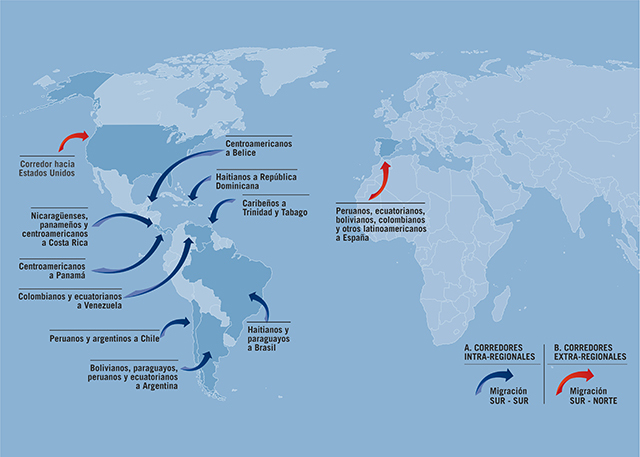 The study “Labour migration in Latin America and the Caribbean,” released in August 2016 by the International Labour Organisation (ILO), identifies 11 main migration corridors used by workers throughout this region, including nine intra-regional, South-South corridors that connect countries in the region, and two extra-regional South-North corridors connecting with the United States and Spain. According to the report, this network is constantly evolving due to changes in economic interdependence and labour markets, and has been expanding in volume, dynamism and complexity, growing from 3.2 million migrants in 2011 to 4.3 million at the start of 2016. Denis Rojas, a Colombian sociologist with the Latin American Council of Social Sciences (CLACSO), mentioned from Buenos Aires other intra-regional migratory causes based on the experience of her compatriots in Argentina. “It is necessary to bear in mind that the migration to Argentina seen in the past few decades is of different types: one well-identified group is that of generally middle-class professionals, who in view of the high costs and the constraints of access to postgraduate education in Colombia, decide to look for other options abroad, with Argentina being a country of interest due to its wide educational offer and accessible costs in comparison with Colombia,” she told IPS. Moreover, “several years ago, the number of families sending their children to study in Argentina started increasing due to the high tuition costs in Colombian universities and extensive structural limitations to access education. It is similar to the case of Chile,” she said. But although the main driver of this current of migration is access to education, Rojas doesn’t rule out labour causes. “It responds fundamentally to Colombians’ need to enter the labour market. Due to the unemployment and a pervasive flexibilisation of labour standards, people believe that a higher level of education will give them a chance for a better income and better jobs,” she said. Another group of migrants, she said, are those who were driven out of their homes by Colombia’s armed conflict. They range from poor peasant families and labourers to students and better-off activists. “Insertion into the labour market depends in this case on the existing support networks,” she stressed. The ILO points to several common labour-related aspects in these migration flows, which are important to note on International Workers’ Day, celebrated on May 1st. It mentions the “feminisation” of labour migration, with women accounting for more than 50 percent of migrants; the high proportion of irregular and informal migrant workers and the low access to social protection; and the frequently deficient work conditions as well as the abuse, exploitation and discrimination faced by many migrant workers. This is the case of a 35-year-old Peruvian migrant to Argentina, identified as Juliana, who was originally from the department of Arequipa in southern Peru. To pay for her university studies, she worked five years as an unregistered domestic worker. “At that time it was the only kind of work we could aspire to as foreigners with no contacts and often without the necessary papers. Back then, there was no immigration law as we have today, and it was very difficult to find something better. It took me three years to get my national identity document,” recalls Juliana, who is about to become a lawyer. Pilar, a 34-year-old Colombian who has been in Brazil for eight years, mentioned a problem faced by many other migrants: they can only get jobs for which they are overqualified. Although she has a university degree, she had to work in a hostel without a contract or labour rights. “Many of the young Latin American migrants in Río de Janeiro end up being absorbed by the tourist market. I had no working permit the first few years and I would take whatever work cropped up. I would work over eight hours, with barely one day off a week, and they paid me less than minimum wage,” she said. 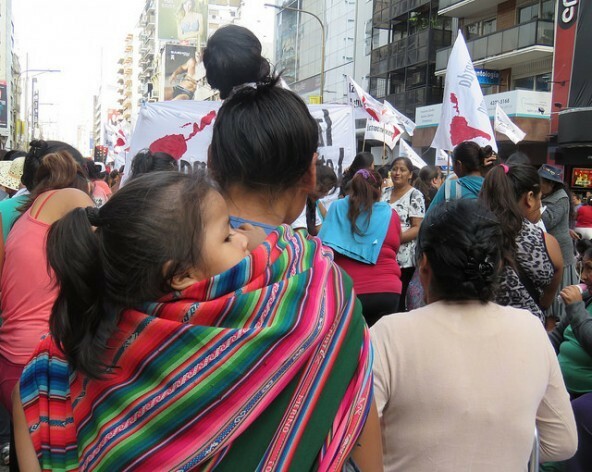 In Brazil as well as Argentina, Bolivians work in large clandestine textile sweatshops in near-slavery conditions, a reality that is repeated among migrants in different sectors and countries. The ILO study points out that there are also migration corridors to other regions. Of a total 45 million migrants in the United States, more than 21 million are Latin American. In Spain, nearly 1.3 million foreigners living in the country are South American. “The exploitation of Latin American and Caribbean immigrant labour by the central powers is another side of our dependence; they not only plunder our natural resources, but we also provide them labour, which is overexploited. Generating poverty conditions in our region, or in others such as Africa, allows the central powers and their multinationals double benefits: natural resources and cheap labour,” CLATE’s Fuentes told IPS. He is worried about the tightening of US immigration policies and the threat of building a wall along the border with Mexico. “No wall can keep out people seeking to leave behind the poverty to which they have been condemned,” Fuentes said. “Latin Americans seeking a better life in the US undertake a terrifying journey, which costs the lives of many, and those who reach their destination take the worst jobs, with low wages and more precarious working conditions,” he said. “They make an enormous contribution to the US economy, but never get to become citizens and are forced to always live as undocumented immigrants,” he said. This year the annual International Labour Conference, which sets the ILO’s broad policies, will meet June 5-17 in Geneva, Switzerland, with a focus on migrant worker’s rights. CLATE will launch a campaign targeting public employees working in government agencies linked to immigration, to “put a human face on border posts”. “As unions, we also have to represent those migrant workers whose irregular migratory situation is used by employers to get around labour legislation, subjecting migrants to more precarious conditions, and abusing the possibility of temporary employment,” said Fuentes. “Those who don’t have a right to citizenship will always be victims of abuse. As trade unions, we must combat the idea that migrants compete with local workers. We have to accept that we are all part of the same class, which knows no borders,” he said.